IN A PREVIOUS EDITION, I mentioned that I usually start preparing a Newsletter by looking at the preceding one and then the one from a year before, since many of our activities have an annual cycle. That's particularly apt this time, since not only do we have several similar projects to report, but I even had to start Newsletter 42 by apologising for its lateness - the 'November' edition had become a 'Christmas' edition. Here we are again! We always make sure that members and friends receive notice of the Programme in time, but other pressures have once more resulted in this Newsletter being late - apologies. But there is no shortage of things to report. This is the time of year when the 'direct action' side of M.V.C.G. comes to the fore. Garbage raids, of course, are always with us, but autumn brings the Amphibious Garbage Raid on the Malago in Manor Woods; it brings daffodil bulb planting in our public open spaces; and it brings the Christmas 'At Home' (née the Coffee Day). Read about them all inside. And the 'behind the scenes' activity goes on non-stop. There are some particularly significant planning applications this time (see page 6), and on the back page we report on a very promising new initiative with the City Council concerning the management of the woodland in what we call Manor Woods and the Council calls Malago Vale. If things develop as we hope, we could at last have a way to take forward some of the excellent ideas which Julia Bolzek put forward in her report of seven years ago. 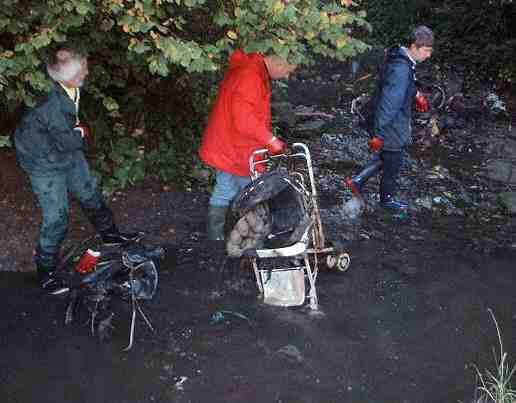 OCTOBER 12th dawned bright and sunny which augured well for the amphibious garbage raid in Manor Woods. More than a dozen members turned up, including several welly-wearers who were prepared to brave the waters of the Malago. 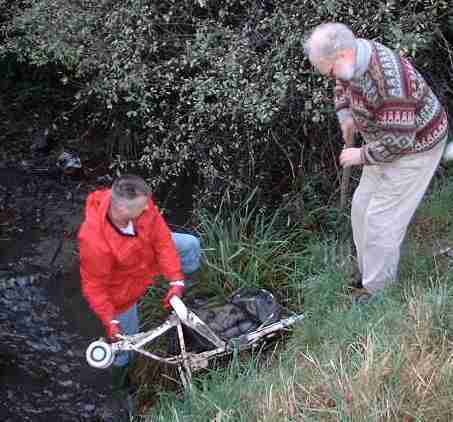 On a previous recce it was assumed that there wasn't much debris in the stream. It soon became apparent that the silt was hiding a multitude of sins and a lot of brute force was needed to drag the larger items from the depths. We made countless journeys to and from the entrance with both Don's and our trolley pressed into service. 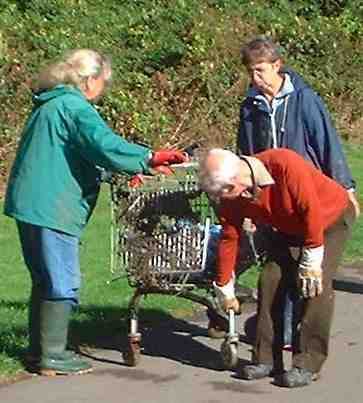 The intention was to leave it ready for the Council to collect as we previously arranged. Mid-morning, Lady Bountiful, in the guise of Lola, arrived with a welcoming flask of tea or coffee for us all. Suitably refreshed we returned to the task with renewed vigour. On reaching the pond we were rewarded with an excellent sighting of the kingfisher before the 'heavy gang', namely André and Lee, came along. They managed to grapple the washing machine drum from the pond as this particular eyesore had been annoying us for some time. Around midday the clear up was complete and we surveyed our 'haul' with amazement. 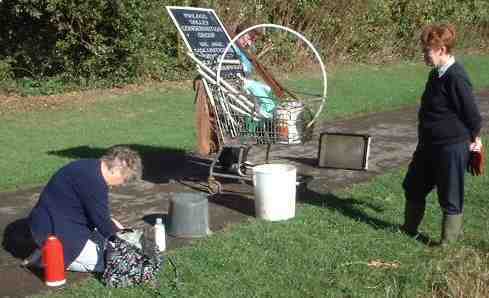 It included two trolleys, two bikes, a pram, radiator, metal table, tyres, fencing, buckets and a pile of scrap metal. Although tired we felt we had achieved a good deal from our morning's work. 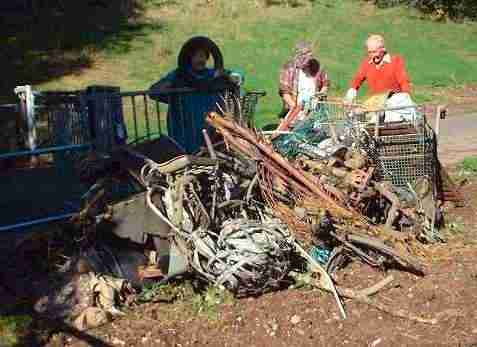 We left the heap by the entrance, as arranged with Steve Sparks of Bristol City Council. We put a notice by it explaining that it would be taken away on Monday and apologising for the temporary eyesore. Thanks to Steve, the heap was indeed completely gone by Monday lunchtime. A NEW GROUP has recently been formed to consider 'Hartwood Acres' - the lower Dundry Slopes which are owned by Bristol City Council. This land used to be leased to Hartcliffe Community Park Farm; the Farm are now concentrating on their immediate site and the Council are open to ideas for the future management of this area. M.V.C.G. is represented on the HARTWOOD ACRES STEERING GROUP, which is open to all. BULB PLANTING has become a fixed part of our cycle of activities. This year our plans were rather more ambitious: brightening up Withywood Park and bringing some colour to the triangle of grass opposite the City of Bristol College in Hartcliffe. Remember our motto: 'Turning Cans into Daffodils'? This was realised as we obtained a £50 voucher from Alupro for recycling aluminium cans (in addition to the usual 40p/kilo for the cans themselves). The voucher was exchanged in B&Q for 800 mixed dwarf daffs. Then 2500 'February Gold' daffodil bulbs were supplied to us at a good price by Riverside Garden Centre. We are very grateful to Riverside for their continued support. We also successfully applied to the 'Greenworks' project for a grant of £130, half the cost of the 'February Gold' bulbs, the remainder coming from our funds. 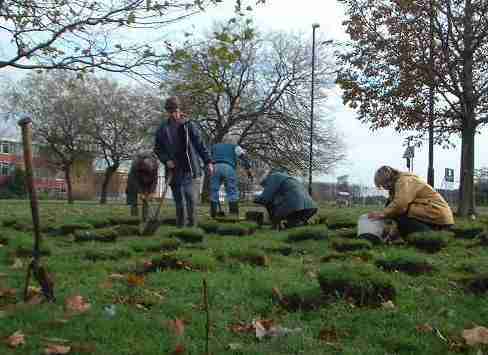 In the end we had a surplus of about 300 bulbs which we donated to the Hartcliffe Community Campus for planting on the Millennium Green. Ten o'clock found us sheltering under umbrellas in front of Withywood Post Office. But the intrepid dozen, including Molly the dog, were not defeated by the weather. In under two hours we planted about 2000 daffodils in three places in the Park. We also managed between us to remember most of what Wordsworth had to say on the subject. Thankfully for our second outing it was dull but dry. We had been planning to plant here for some time and had obtained the necessary permission a while ago. In the interim plans had been made for a cycle path to be laid in the vicinity, so we were very careful to keep within the limits of the trees where no construction work was planned. A group of eleven members set to work and we found it relatively easy, the ground being fairly soft. 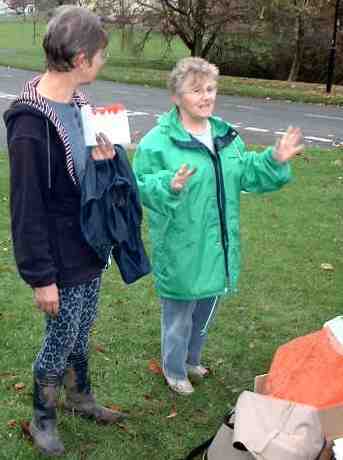 We were supervised by Lola and Marie Jo who made sure we did not stray beyond the boundaries in our enthusiasm. 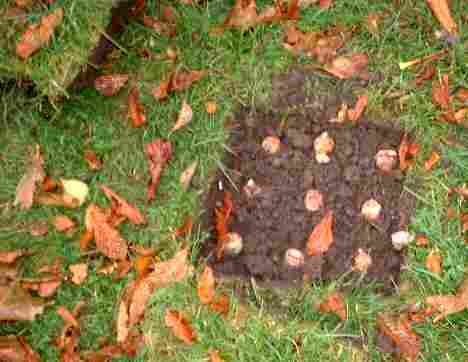 They kept us supplied with buckets of bulbs and we left replacing the turf until the end so that we would not go over ground already covered. In a little more than an hour the job was complete. As we gathered our tools we all agreed that the exercise had gone very well and we look forward to a lovely display in the spring. THIS YEAR, our annual event changed name. The organisers decided to give it a Christmas flavour. We hope that everyone who came enjoyed the occasion. A big 'Thank you' to so many who spent time baking or making jam or chutney, or who gave objects for the Bring & Buy. The event ran very smoothly thanks to our helpers. The proceeds, as usual, went to the Avon Wildlife Trust, the University of Withywood and Malago Valley Conservation Group. We raised a record of £131.80 for M.V.C.G. 's funds. THERE HAVE BEEN some important planning applications in our area lately, many of them affecting historic buildings in the Bishopsworth & Malago Conservation Area. The expected application for new houses in the grounds of the Old Vicarage, Bishopsworth has now come in. The applicants want two bungalows, a pair of semis and a terrace of three houses in the garden. The new houses would face inwards, but they would be an over-intensive development in the area, and they would have serious traffic and parking implications. We are opposing this application, as are, not surprisingly, the residents of Ilex Close. We are in touch with them, and with the ward councillor, Cllr Richard Eddy. An application has been made for Brook Farm, 55 Whitchurch Road. This site, formerly a petrol station, received permission in August 1999 for a car-wash, including the demolition of the farmhouse, one of the few survivors of the farms which once ringed Bishopsworth 'village'. We opposed that application, but the Planning Committee felt that it could not be refused, since the site was not quite in the Conservation Area. When the development was not implemented and the site was put up for sale, we worked with the Council to get the Conservation Area extended so that the farmhouse would have better protection from future demolition. Although the site is designated in the Local Plan for employment use, the application is for residential development. We have no objection to this change, and we support in principle any use which will save Brook Farmhouse. The actual application is to convert the house into two flats and to build two new blocks of flats, one each side of the house; there would be a courtyard in front of the farmhouse, which would be visible from the road. The proposed new blocks are three-storey, higher than the farmhouse, and the application doesn't include particulars of the materials which would be used. We will be supporting the principle and commenting on some details, but our main concern is that this application is dealt with quickly so that the building does not deteriorate further. Also in the Conservation Area, there is a retrospective application for some additions at the Manor House, Bishopsworth; we will make some minor comments. And application has been made for the rebuilding of Bedminster Down School on its existing site. The plans look good, and we will comment only on some wildlife aspects. MALAGO VALLEY CONSERVATION GROUP'S own events are shown by the symbol. The regular evening meetings on the third Tuesday of each month are held at St Peter's Rooms (by the side of St Peter's Church), Bishopsworth, and start at 7.30pm. Monday 9 December: Informal Walk on Hartwood Acres, arranged by the Hartwood Acres Steering Group. Meet at 1.00pm at the end of Kencot Walk. See also the event below, and page 3. Wednesday 11 December: Ordinary meeting of the Hartwood Acres Steering Group starting at 2.00pm in the Ledbury Room at the Gatehouse Centre. Thursday 12 December: Masterplan and Mince Pie event by HARTCLIFFE COMMUNITY CAMPUS at the City of Bristol College, Bishport Avenue, Hartcliffe. Between 2.00 and 8.00pm, the HCC team will be available for informal discussions about the masterplan for development of the Campus site. Tuesday 17 December: Our unpredictable, slightly silly, but always fun CHRISTMAS PARTY. As usual, we shall finish with an American supper, so please bring a little something if you can. Monday 6 January: Garbage Raid. Meet at 3.45pm at the Finger Post at the junction of Church Road and Grange Road. Tuesday 21 January: For our first meeting of 2003, our speaker is Mrs Shepherd from the Cotswold Area of Outstanding Natural Beauty. Can we learn from their experience for Dundry or Mendip? Monday 27 January: Garbage Raid. Meet at 3.45pm at Symes Avenue. Tuesday 18 February: Our Annual General Meeting and Birthday Party. As usual, we shall celebrate our birthday with refreshments, preceded by a report on the year's activities, and a special guest speaker (more details in the January Newsletter). THE BISHOPSWORTH QUIZ on 19 November was, as usual, a most enjoyable event. The M.V.C.G. team did better than ever, coming third. Despite various M.V.C.G. members being involved in different teams, and in setting the questions, no fights broke out. The winners were the Malago Society, who will set the questions next year. AT OUR A.G.M. last February, our speaker was Warren Doe, who was working on management plans for woodlands throughout Bristol. Of particular interest to us, of course, was Manor Woods. Warren told us that we would be consulted on the draft management plan in the summer. Well, summer came and went - and so did Warren! He has left Bristol, but his boss, Richard Ennion, has taken over this task, and there was a meeting on 4 November jointly with Bedminster Down and Uplands Society to hear Richard explain the plans for Manor Woods and for 'Bedminster Down Common' - the woodland near the 'Cross Hands'. Richard wants the plans to be agreed and supported by community groups like us and B.D.U.S., so site visits were arranged to discuss ideas on the ground. Timing of the Newsletter meant that we couldn't let everyone know in advance, but the visit to Manor Woods was on Sunday 1 December. It was a very positive meeting, with the few changes we wanted to the plan being readily agreed by Richard. We now have to formalise the plan, and we have agreed to help by applying for grants which are not available to the Council to enable the work to proceed. More news soon!